SPARTANBURG, S.C.—Authorities in South Carolina say a man fleeing a traffic stop left his daughter to die in a burning car. 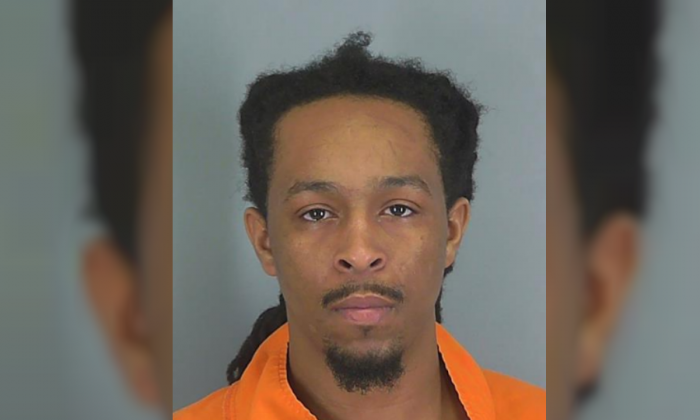 Imhotep Osiris Norman, was booked on April 13 after he fled South Carolina Highway Patrol (SCHP) troopers attempting to stop his car at about 10:20 p.m. for traveling 67 mph in a 40 mph zone on highway 14 near Concourse Way, reported WSPA. After entering Interstate 85 from the highway, Norman’s car started to smoke and catch on fire, according to troopers, who immediately alerted the fire department. At one point during the chase, the suspect threw a large bag out his window. Several miles later the car became fully engulfed in flames, prompted Norman to slow his car to about 30 mph. The car then rolled to a stop before Norman jumped out and escaped from the scene. After firefighters extinguished the flames, they discovered a body in the backseat of the car, reported the news station, citing SCHP. The Spartanburg County Coroner’s Office was called to the scene and identified the body to be 1-year-old Xena Rah’Lah Norman. The coroner’s office is currently conducting an autopsy to determine the cause of death. Police spokesman Anthony Guglielmi told the Associated Press in March that officers tried to pull over a vehicle for a traffic offense but the car did not stop, ran a stop sign, collided with another vehicle before hitting a tree. In the process, the girl was ejected. According to preliminary numbers by the South Carolina Department of Public Safety, 222 have died on South Carolina roads in 2019 between Jan. 1 and April 7. This is down from 244 in 2018 and 256 in 2017 over the same period. Seven people were killed on the roads last weekend alone between Friday, April 5, at 6 p.m. until Sunday, April 7, at 11:59 p.m. The department said of the 222 people who have died in 2019, 150 had access to seatbelts, and 69 were not wearing seat belts. Moreover, 41 pedestrians have died compared to 38 in 2018, 14 motorcyclists have died compared to 21 in 2018, and nine bicyclists have died compared to four in 2018 on state roads and highways, the department said.